ST. LOUIS - Webster University is one of the top universities in Missouri for sending students to study in other countries and for hosting students from other countries to study in the United States, according to the 2018 Open Doors report. The report was released by the Institute for International Education (IIE) this week. The report surveyed more than 1,500 colleges and universities in the United States. 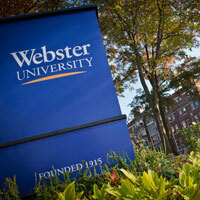 Overall, Webster University is ranked in the top third among all institutions for students participating in study abroad programs. 1st among all master’s level private institutions in Missouri for hosting the most international students. 3rd among all private institutions in the state for hosting the most international students. 12th out of all institutions (private non-profit, private for-profit, and public) in the state for hosting the most international students. 3rd out of all private institutions in the state for sending the most students abroad. 7th out of all institutions in the state for sending the most students to other countries to study. In the top third among all institutions in the United States for hosting the most international students. In the top third among all institutions in the United States for sending the most students to study abroad. Open Doors is published annually by the IIE. IIE collects data on study abroad and international students from institutions through annual surveys. Study abroad headcounts reflect the number of individual undergraduate and graduate students from domestic locations who were U.S. citizens or permanent residents and studied abroad between Fall 2016 and Summer 2017. International student headcounts reflect students studying at domestic locations on temporary non-immigrant visas during the Fall 2017 session only. The complete “Open Doors” rankings can be found online at http://www.iie.org/Research-and-Publications/Open-Doors.